High-quality dividend stocks can produce market-beating returns over the long-term. For evidence of this, consider the outperformance of the Dividend Aristocrats, a group of stocks in the S&P 500 that have increased dividends for the past 25 consecutive years or longer. Not only have the Dividend Aristocrats outperformed the S&P 500 Index during the last 10 years, which included one of the strongest bull markets in history, but they also tend to outperform during recessions. The same cannot be said of growth stocks like Tesla, Inc. (TSLA). Tesla shares produced excellent returns since its initial public offering. But investors need to have the right mindset before buying the stock. Tesla is a highly risky and volatile stock. 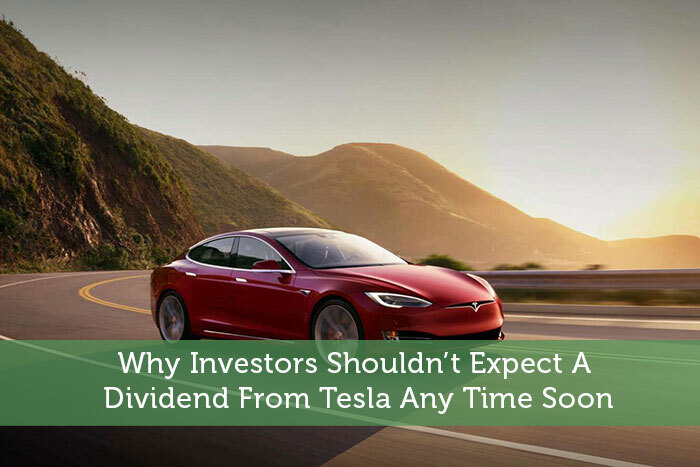 And, unlike the Dividend Aristocrats, Tesla has not paid a dividend to shareholders since its initial public offering, currently does not pay a dividend, and is not likely to pay a dividend any time soon. Dividends are usually paid by large, mature companies with highly profitable business models. Dividend stocks, like those that comprise the list of Dividend Aristocrats, can easily afford to distribute a portion of their earnings to shareholders. They bring in more than enough cash flow to fund their growth, satisfy their debt obligations, and reward shareholders with dividends. On the other hand, growth stocks rarely pay dividends to shareholders. For companies like Tesla, the focus is on growth. Tesla needs to reinvest every dollar of cash flow back into the business, to grow the business and stay ahead of the competition. The company has been successful in this regard. Revenue and vehicle shipments continue to grow at a high rate. Tesla’s Model 3 production exceeded 4,000 units per week last quarter. The company is achieving better cost results, which allowed it to post a profit of $1.75 per share last quarter, reversing a loss of $4.22 per share in the same quarter last year. But before investors get too excited that Tesla has finally reached consistent profitability, it should be noted that Tesla still posted a loss of $6.56 per share over the first nine months of the year. Add to this the structural hurdles of Tesla’s core industry. Automotive manufacturing is inherently a low-margin business. It also has very high barriers to entry, with established giants like Ford and GM capturing the bulk of market share. 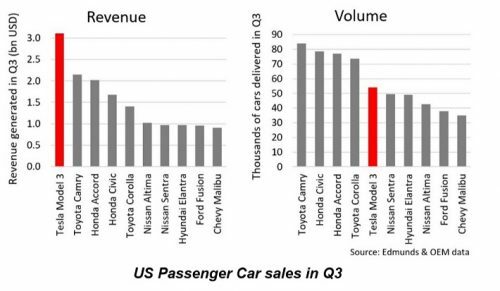 Tesla’s road to achieving steady profitability is doubtful. Tesla, like many other growth stocks, does not generate profits consistently enough to pay a dividend. Tesla has reported losses consistently over the past several years. In 2017, Tesla generated more than $11 billion of revenue, but the company reported a net loss of $1.96 billion. Tesla lost $11.83 per share last year, and the company reported net losses each year for the past decade. In order to keep financing its increased vehicle production and acquisitions, Tesla has sold shares and issued debt, both of which make a dividend even less likely. Tesla’s share count increased by 15% last year, and the company took on more than $4 billion of additional debt in 2017. Tesla ended the most recent quarter with $23.41 billion of total debt, including $9.67 billion of long-term debt. compared with cash and cash equivalents of $3.47 billion at year-end. Tesla’s growing debt will need to be repaid, and with a weak credit rating and interest rates on the rise, debt repayments will be a considerable burden on the company’s ability to pay a dividend to shareholders. There are three major categories of stocks: growth, value, and dividend stocks. As their name suggests, growth stocks are typically bought for their rapid sales and earnings growth. Often, growth stocks come from the technology industry, and in general are at an earlier stage of development. Growth stocks like Tesla frequently hold high valuations, but investors are usually willing to pay higher prices for their above-average growth potential. On the other hand, value and income stocks are significantly different from growth stocks. Value stocks are those that typically hold lower stock valuations, typically measured by the price-to-earnings ratio or similar valuation metrics. Dividend stocks appeal to income investors, such as retirees, who buy and hold stocks to generate consistent streams of dividend income. While growth stocks like Tesla tend to get most of the attention, the Dividend Aristocrats have provided excellent risk-adjusted returns. For example, in the past 10 years through November 30, the Dividend Aristocrats produced annual returns of 14.6%. Compare that with the broader S&P 500 Index, which generated annual returns of 13.6%–a full percentage point less than the Dividend Aristocrats. To be sure, Tesla has also generated strong returns since its 2010 initial public offering. Investors who bought Tesla shares the day it went public have seen their investment rise in value by over 15-fold. But for investors thinking of buying Tesla shares today, they should keep in mind that past performance is not a guarantee of future results. Tesla is a highly risky stock. The company has repeatedly reported losses since it went public, the stock pays no dividend, and the company has increased its debt position to finance its growth. Tesla continues to sell junk-rated debt to fund its operations. As a result, the primary use of cash flow is to continue investing in growth and pay down debt. All of this means that a dividend to shareholders is one of the last things on Elon Musk’s mind right now. There are good reasons to buy Tesla stock, primarily its growth potential. Tesla fits the definition of a growth stock. Its electric vehicle technology revolutionized the auto industry, and it could soon revolutionize the renewable energy industry as well. Shareholders who had the vision to buy Tesla stock after its IPO have been richly rewarded. However, only investors with a high tolerance for risk should consider buying Tesla today. Value and income investors should steer clear of Tesla. Instead, risk-averse income investors looking for steady returns should focus on high-quality dividend growth stocks like the Dividend Aristocrats, because a dividend from Tesla is highly unlikely.